When I started building my home gym, I knew I wanted to get the kind of equipment that would allow me to make the most of my space. I didn’t have a wealth of room for large pieces of equipment, so I had to narrow down my list of what I needed and what I could actually get. The best push up bars were a must for me, especially considering my current fitness routine. The world of rickety, sub-par push up bars became infuriating. I didn’t want to keep replacing my equipment every time it couldn’t hold up to a workout, I needed the very best ones. These are all push up bars I’ve tried that haven’t let me down. It’s surprising how easy it is to wind up with a piece of junk, and I don’t want anyone else to have to go through the same trial and error process I went through. These are the five-star push up bars, and any of them would be the perfect addition to your home gym or workout room. The first thing that drew me to these push up bars was the rectangular bases. A lot of push up bars have circular bases, and I really believe that’s where a lot of the problem comes from. The circular bases don’t allow for proper weight distribution, so those kinds of bars tend to slide and bend. These give me the stability that I need. It’s all in the shape. These are T-Bar style push up bars. The first time I ever used push up bars like these was at a Crossfit gym, and I don’t know if they were this exact same brand, but they were very similar and I liked them a lot. The welds are really strong, and I never feel them buckle under my weight. I can be very aggressive with them, like in high intensity interval training, and I never feel the weld points moving around. The rubber feet are definitely non-skid. I’ve used these push up bars on both tile floor and carpet, and I’ve noticed that it doesn’t make a difference what kind of flooring I’m on. They stay put, and I don’t need to worry that they’re going to slide around and cause me to face-plant in the middle of a push up. They’re sturdy, and the feet are great. The only gripe I have with them (although it’s very minor) is that I find they get a little slippery when I’m sweating. They don’t have much of a texture to them, so they aren’t rough on my hands, but that also gives them a little bit of slide. If I use palm grips or grip tape, I don’t really have that problem. I wrapped some tape around the bars to prevent slippage and I’ve found that it’s been working great so far. These are very similar to a much more expensive kind of push up bar, and they’re the exact same quality. I like that I was able to get the same style of push up bars that they have at the Crossfit gym without having to pay the same price. If you’re into high intensity intervals or rigorous workouts that mix things up a lot, I would highly recommend these push up bars. These push up bars have that same Crossfit style design, but they perform a little differently. The biggest advantage of these push up bars is the variable knurled grip options. If I don’t want to mess around with my grip gloves or grip tape, I don’t need to. I feel like I get a strong enough grip directly onto the bars, which is a huge advantage. I don’t need to have any accessories available to use them, and I don’t need to full-on get ready to work out. I can just get in a quick 20 minute workout before I hop into the shower without having to put on grips or deal with the tape. I just get that fast round of push ups in before work to get my blood flowing. One of my favorite things about these push up bars is how big they are. I had used a lot of smaller push up bars before I finally got around to trying these, and the size really does make a huge difference. The bars that are tiny and lower to the ground don’t really do much to help me when I’m working out. I question how sturdy they really are, and I’ve actually bent and broken those kinds before. The strong solid steel is great for things like handstands. I love doing handstands at the beginning of my workout as part of my warm up routine. The texture of the bars makes me feel secure, and I’m never concerned that they won’t hold up to my body weight. Assembly is a little tricky. These push up bars are great for both working out and warming up. I can even see how they would be useful for people who want to practice complicated yoga poses. They’re versatile and affordable, making them a perfect addition to a garage gym. Their durability and reliability have encouraged me to experiment with new exercises, and they’re definitely worth the money. The versatility of this push up bar is what drew me in. It has a unique design. It’s a solid piece, and it’s built in a curved shape. It’s designed to fit over a stability ball or a balance ball, but you can also use it directly on the floor. You get a wide variety of options. Using it on a balance ball is significantly harder, and it took me a while to learn how to get those moves right. It’s a much more intense workout. I typically use my balance ball for ab workouts, like crunches. Using this push up bar with the ball added a whole new layer of intensity to my workout. I really feel the burn. I can’t do it all the time (because resting up and not pushing yourself too hard is very important), but every time I do it I can actually tell that every muscle in my body is engaged. There are a bunch of handles on this piece of steel, and it was a little confusing at first. It’s for three separate hand positions – average, narrow, and wide. I like to use the wide grips to engage my chest, and the narrow grips to engage my back. not like with other push up bars, where you need to move them and calibrate them to adjust your grip. You can rapidly switch from one position to the next without stopping what you’re doing. It’s supposed to be able to handle over 700 pounds of weight, and judging by how solid it feels, I believe it. I don’t plan to bulk up too much, but it’s nice to know that I will absolutely never outgrow these. Even a major lifter could use these – someone like The Rock (260 pounds) or Big Show (383 pounds) wouldn’t even begin to push the limits of this push up bar. This is a very one-and-done push up bar. It takes the place of any accessory you could use with a balance ball. Best of all, it feels like an entire house could fall on it without even leaving a dent. This is perfect for someone who primarily uses a push up bar as their core piece of workout equipment, especially if they need it to do as many things as it possibly can. It’s well worth every penny, and I use it all the time. The price of these is what made them most attractive. They’ve very cheap – in fact, they’re less than half the price of what I paid for most of my other worthwhile push up bars. I really didn’t have high hopes for them since I’d had so many bad experiences with. These outperformed every cheap pair of push up bars I purchased. They even come in different colors. These are a small size, but they don’t sacrifice stability to be more compact. They’re made of steel, and they have foam grips in the center. This is something I appreciate. Since the poles are so shiny and slick, you wouldn’t be able to use them without some sort of grip. The one that’s built directly onto the center of the bars is a firm material with a lot of texture. I’ve never slipped on it, and I’ve never felt like I needed more grip to be able to use them safely.Even though these push up bars are on the smaller side, they’re still high enough for things like L-sits where you need some clearance from the ground. They don’t weigh a whole lot, which made me nervous at first, but they don’t slide when I do L-sits with them. They also have non-slip caps on the feet, though they don’t have the skid resistant texture that some of the more expensive push up bars have. I always use them on a workout mat, and I find that they’re perfectly slip resistant on the right kind of surface. If you don’t want to spend a lot of money on push up bars but you still need something you can depend on, these are the best choice for you. I really wasn’t expecting them to be so good. I absolutely recommend these to people who need to save the cash. They may not be as big as Crossfit push up bars, but you can do almost all of the same things with them. If you need them to be higher and you don’t mind the work, you can easily (and cheaply) bolt them to some crates for a little extra lift. The shape of these intrigued me. I wasn’t familiar with what a yoga wheel was before I got these push up bars. They’re a multifunctional piece of equipment. When flipped one way, they’re push up bars. When you roll them in the other direction, they’re yoga wheels. I can’t really speak to how great they are as yoga wheels, because they’re the only yoga wheels I’ve ever used. As push up bars, on the other hand, they work spectacularly. These are solid pieces, completely welded together. They also come with grip tape and grip pads to make them easier to use during intense exercise. At first, I was a little worried that the grip was welded underneath the ring rather than above it, but it needs to be able to roll. The weld feels strong, and it doesn’t feel like it will budge. I can really put my full weight on the grip and give it a hard time, and it won’t move at all. 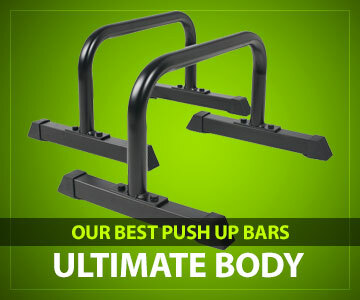 The size and shape of these push up bars keeps them from getting in the way. I feel really stable when I do planks with them. They give me just the right amount of lift, and they don’t take up too much space. With larger push up bars, I sometimes feel like I need to work around them a little bit. These ones don’t obstruct my movements, so I can work out fluidly. The grip tape that comes with them is quite good. The bars themselves have a textured powder coated finish that minimizes slip, but the grip tape makes the experience even better. I haven’t had to replace the tape for a while, either. It’s a very low maintenance setup, and I appreciate how simple these are to use. These push up bars are the best of both worlds for people who dabble in several different workout styles. They’re just as good for yoga as they are for push ups or Crossfit, and it’s rare that you find a piece of equipment that can seamlessly allow you to do both. You’re getting a lot of options for your money, and the push up bars themselves are of outstanding quality. I’ve been through a lot of garbage workout equipment in my day, and it makes me happy to report that tall of these push up bars hit the mark. I feel like they’re worth what I paid for them, and I like how many versatile options I can get out of all of their design differences. I’ve tried my hardest to choose something for everybody who wants to get fit and needs reliable equipment to help them get there. I own and love all of these. Why Do I Need Push Up Bars? How Can I Check The Quality of Push Up Bars? Why Do Push Up Bars Come in Different Heights? Are Expensive Push Up Bars Worth The Money? Are Plastic Push Up Bars Any Good? What Is The Difference in The Shapes of Push Up Bars? What Else Can Push Up Bars Do? How Do I Get Used to Using Push Up Bars? Workout equipment sometimes seems a little more complicated than it needs to be. When you go to the gym, you can usually just watch what other people are using and copy their methods. When you prefer to work out in the privacy of your own home, choosing your gear can be tricky. When you’re on the market for push up bars, there are a few things you’ll want to ponder before you make your final selection. For years, people have been doing push ups directly from the floor. Why, all of the sudden, are people buying special bars to help them do push ups? The short answer is that they help you get more out of your workout. By lifting yourself further off the ground and even suspending your core, you’re getting another dimension to a push up that wasn’t previously possible. They help you get a better grasp for wider or narrower push ups, which engage your shoulders and triceps a little more intensely than a standard floor push up. Since you can lift your legs completely off the ground, you’re also building better core strength. They also help prevent wrist injuries. When you’re doing a push up directly from the floor, you’re prone to something called hyper extension. You put a lot of strain on your wrists, and because there’s nothing to stabilize them, this strain can lead to injury over time. Push up bars stabilize your forearms. They take some of the undue burden off of your wrists by minimizing and distributing the impact of the workout. If you have carpal tunnel or arthritis, you might even find that push up bars make it easier to work out without experiencing nerve pain. Push up bars make it easier to do more than just the standard push up. You’re getting an all-encompassing workout for a similar amount of effort. This means you’ll see results sooner and you can spend less time working out. It’s quicker and better for your body. Push up bars need to be incredibly sturdy. They have to be able to hold at least your entire body weight for prolonged periods of time. That’s why weight limit is so important. Ideally, you’ll want push up bars rated for a weight substantially higher than your body weight so you can be sure that you’re never pushing them to their limits. Another thing you want to look at is the construction of your push up bars. Many of them are welded together, which is fine if they’re welded well. Models that require you to bolt pieces together are never really that sturdy – over time, the slight rocking motion of your push ups can strip the threads and loosen the bolts. When that happens, there isn’t a whole lot you can do to fix the problem. I’ve broken several of these bolt on models, even during lazy workouts. I can’t recommend them, because they aren’t made to last very long. Before you know it, you wind up having to buy new bars because your damaged bars can’t be fixed. That’s why it’s worth your time and money to spring for a model that’s constructed as a solid piece. When there’s no seams and no bolts, there’s nothing that can come apart on you. No matter how hard you work out, nothing can snap. The next most important thing to consider is the quality of the metal. Soft metal can (and will) bend and warp on you. If your push up bars are starting to bend or soften in two different directions, it’s totally impossible to do a perfect push up. You’ll slide, they’ll slide, and you can really hurt yourself. Solid steel is the way to go – it’s the same material that most quality gym equipment is made of because it can handle the stress of frequent use. Slipping and sliding can happen with push up bars, especially if you’re using them on a smooth surface. Look for push up bars with non-slip feet. Even if the non-slip material isn’t that great, you can use your push up bars on a textured workout mat for a little extra reinforcement. You’ll also want to check out your grip options. If you can’t get a good grasp on your push up bars, it doesn’t matter how strong you are – you won’t be able to use them. Bars that don’t come with grips can be used with palm grips (like the kind you use for Crossfit) or grip tape for improved traction. If you need good palm grips, it’s easy to find a decent pair that won’t break the bank. If you’re only looking to do elevated push ups, you don’t need your push up bars to stand high off the ground. That height comes in handy for things like L-sits, where you need enough space to lift your lower body off of the ground. The height will also allow you to do deeper tricep dips. If you aren’t sure what height you need, start with shorter ones. Get comfortable using them. As you grow in your athletic ability, graduate to taller push up bars. They’ll allow you to make your workout a little more challenging by giving you the space you need to meet larger goals. You don’t have to get rid of your smaller ones when you graduate to larger push up bars. Keep them for handstands and warming up. You’ll still have plenty of reasons to reach for short push up bars, even when you’re an expert at working out your core. Yes. Expensive push up bars are worth the money. While they don’t look like complicated pieces of equipment, you need to consider what they’re made of. Good metal (like solid steel) is an expensive material to work with. If you’re buying really cheap push up bars, chances are that they’re made of a softer kind of metal. Push up bars see a lot of abuse. They get warm while you’re using them, and metal expands and contracts with temperature. It’s worthwhile to invest in expensive push up bars that you know are going to last you a long time. You aren’t really getting a deal if you have to throw away the cheap ones after six months – it’s a better investment to get higher quality push up bars that will virtually last you a lifetime. This doesn’t mean you can’t find high quality push up bars at affordable prices. Plenty of them exist. I have a few sets that didn’t break the bank, and I use them all the time. It just means that you should be a little more discerning and skeptical of any workout equipment that seems dirt cheap. I wouldn’t recommend plastic push up bars to anyone. More or less, they’re glorified pieces of PVC pipes, though some of them are even thinner. They can’t handle high amounts of body weight, and by that, I mean most of them cap out at around 170 pounds max weight. They’re prone to slide around. They’re flexible, and that’s absolutely never comforting. I always find that they feel dangerous, and a lot of people have had bad experiences using them. They bend, and they can break. The last thing you want is a sharp piece of plastic stabbing through your palm with the pressure of your whole body weight behind it. This is something that rarely happens, but it’s far from impossible. You’re more likely to develop small cracks in the plastic that will pinch your hands while you’re doing push ups. Either way, it’s not worth the hassle. Avoid plastic bars at all costs. Some push up bars come with circular bases. I’m not a big fan of those. I can’t feel safe and comfortable when I work out if my push up bars aren’t properly distributing my weight. They always feel like they’re going to break, and eventually, they do. The shape itself doesn’t necessarily matter, as long as the bottom is reinforced. You’d be best off finding push up bars that are one solid piece, with braces running along the bottom. Reinforced bottoms absorb the impact of a hard workout and prevent strain on the top of the bars. You don’t want to overwork a small piece of metal that needs to handle your whole body weight. Push up bars are for more than just push ups. You can do almost any core exercise with push up bars, including planks and handstands. A lot of gymnasts use them to practice and warm up. They’re also popular among the yoga community because they’re ideal for practicing poses that involve a lot of core strength. Push up bars are perfect for L-sits, handstand pushups, and tricep dips. When you’re directly on the floor, you can only go up. If you go down any further, you’re just pushing your body into the floor. The elevation you get allows you to add a new dimension to your workout without expending too much additional effort. The first time people use push up bars, they might get a little confused. It really changes the way you work out by plugging in that extra dimension. Admittedly, it’s a little bit harder at first. It took me a while to master them, and even longer before I was able to get in an intense workout with them. You need to have a certain level of upper body strength before you can take a crack at the more difficult exercises. Start by doing regular elevated push ups with your bars before you attempt wider grips or handstand push ups. Don’t try to master them in a single day. Your body needs some time to recover and get used to them if everything is still new to you. You don’t want to push yourself too hard and wind up with a workout injury that could set you back a week while you’re recovering. Rome wasn’t built in a day, and neither was a strong core.